Now you just have to choose the effect and change its default value. The preview of the selected image is immediately updated to reflect the newly applied effect. Other options in this window allow you to apply the selected effect only to the thumbnail of the selected image or to all images in gallery. 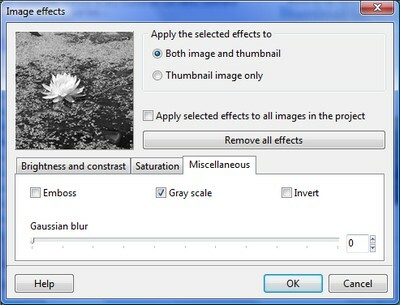 The Remove all effects button resets the default values for all effects.